New weekly report from Ben. Just came out. Full one to be released on Thursday. Lots of explosive revelations here, it seems. Ben confirms what many have been reporting, that tonnes of events are happening, right now. “The great purge of Khazarian mobsters continues as hundreds of arrests of Saudi princes, generals, and politicians is now being followed up with the 842 sealed indictments against senior Khazarian gangsters in the U.S., confirmed by Pentagon, CIA, and other sources. “Pentagon sources sent the photos below showing Hillary Clinton and U.S. 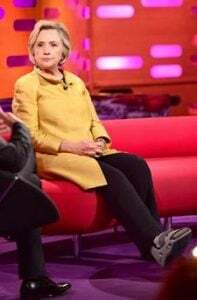 Senator John “Daesh” McCain “in custody wearing orthopedic boots to hide GPS ankle bracelet on their right leg.”… House Minority Leader Nancy Pelosi has been deliberately acting senile in public recently in order to have a medical excuse to avoid arrest, NSA sources say. These same NSA sources are now saying the mass shooting that took place in Las Vegas on October 1 was an attempt by mercenaries working for the G4S security company http://www.g4s.com/ hired by George Bush Sr. to create a distraction in order to kill U.S. President Donald Trump and Saudi Crown Prince Muhammad Bin Sultan (MBS). Trump and MBS were meeting in secret at the suites in the Mandalay Bay Hotel, owned by MBS, to discuss the mass arrest of the perpetrators of the 9/11 terror attacks, these sources say. Both Trump and MBS were evacuated safely and the arrests have now begun in a way that can no longer be denied by the corporate propaganda media, multiple sources confirm. As the arrests were taking place, Trump had a secret meeting in Vietnam with Russian President Vladimir Putin and Chinese President Xi Jinping. Here is what a CIA source, who had eyes and ears at the meeting, had to say.